Need opinions. Building a 67 Olds w/455. 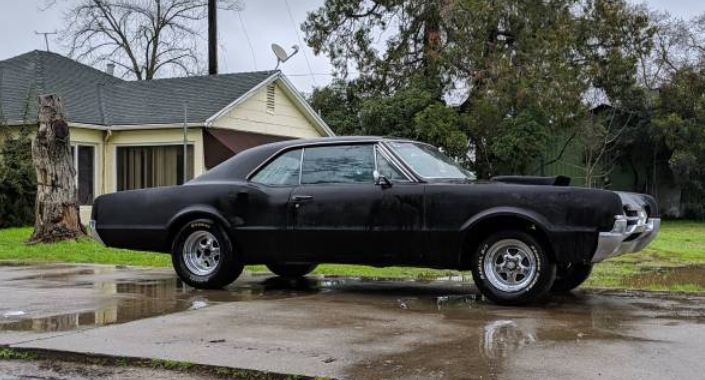 What 1/4 mile time & trap speed is reasonable for this build: 3200lbs (lightened), 440hp 468ci (.060 over), built 200R4 (steeper 1st gear, OD, etc), 3.55 axle w/Eaton posi, and a set of Mickey Thompson Sportsmans (L60s rear and 225/70 front)? What 1/4 time & trap speed should this combo be able to attain? Last edited by Chris6542; April 16th, 2019 at 07:35 PM. 440 crank shaft HP has the potential to run 121.5 MPH @ 3200 pounds. 1320/121.5=10.86 ET. Now the question is: will the OD trans let you reach that potential, I don't think so, but the results will be interesting. I will say high 11s to 12s. Thanks for the thoughts Vortecpro. I was thinking low 12s @ perhaps 110mph. I'll report once running and dialed in. Thanks again. HMMMM the big question is how efficiently can you put the power down. I ran 12.20's with about 360 HP from a 355 olds and I know I was leaving some on the table but the 360 HP was based off of the 1/4 mile trap speed and weight. Hit the track and get some base numbers. Thanks to all for the great input, I expect it to run well. I would be pleased with perhaps a 12.2 @ 110. Though Im sure it wont stop there. Thanks again to all. german 68 442 fan - is it a trap? All 403 cranks drilled to accept 4-speed input shaft? What is the depth of drill hole needed in the crank for a 4 speed input shaft?